The first few seconds of this video are deliberately black screened. Do not adjust your television set. Over the passed several years, miniturisation in electronics has resulted in the ability to move computing from the desktop or laptop computer and position processing power and sensors directly within interactive objects. This concept or phenomenon is sometimes called pervasive computing. It means that, as Human Computer Interaction (HCI) designers, we have the opportunity to rethink the way we interact with artefacts that rely on digital processing to do their job. We can break free from the overtly machine like nature of interfaces, and create something more instinctive and ‘natural’. It’s my contention that digital musical instruments are no exception. In this, my master’s thesis (for which I proudly received a 12) I created a mash up of a digitally augmented snare drum. Aside from changing between presets, all interaction is based on accepted techniques for acoustic drums, and all the sound is processed, synthesised, amplified and transmitted from within the drum itself. Evaluation showed, as with all musical instruments, personal tastes vary, but new performance capabilities were clearly identified without the need to learn new techniques or battle with parameter adjustments. A new take on electronic percussion. Comments Off on A new take on electronic percussion. If you ever wanted a safe way to learn the art of snake charming — look no further! Comments Off on Toy or sculpture? This piece was designed to re-frame popular conceptions of technology. By creating a computer mediated artefact that makes people more aware of their immediate surroundings, and the people in it, we aim to make people think about interaction on many levels. Noise Floor Presentation Video from NoiseFloor on Vimeo. I’m proud to be appearing at the Guthman Competetion in Atlanta this year. From commercial products to imaginative stringed instruments to a contraption that allows a fetus to make music, this year’s competition pushes the boundaries of soundscapes and musical design. I will be playing an augmented version of a medieval string instrument that I designed and built with Troels Hammer, Alex Baldwin and Edvinas Peciulis in 2015. We are amongst 24 semi finalists, and the competition is hot! Pat Metheny is amongst the list of previous winners, and judges. So that gives you an indication of how much practice I need to put in! Unless Troels decides he wants to perform instead, in which case I will be standing by with spare tennis strings if the instrument breaks. This was a wonderful project that came out of a proposal from Musikmuseet in Frederiksberg, Denmark. We addressed their desire for increased visitor interaction by building a replica of an instrument in their collection that the public could play. The instrument we chose was slightly taller than the average double bass, had only one string, and sounded like a trumpet: The Tromba Marina. We made the instrument more playable by feeding sound from the bridge, electronically, back into the body. We also simulated the sound made by the instrument’s vibrating bridge using pure data. For this project I designed an audio based computer game. The player controls the environment with their voice. 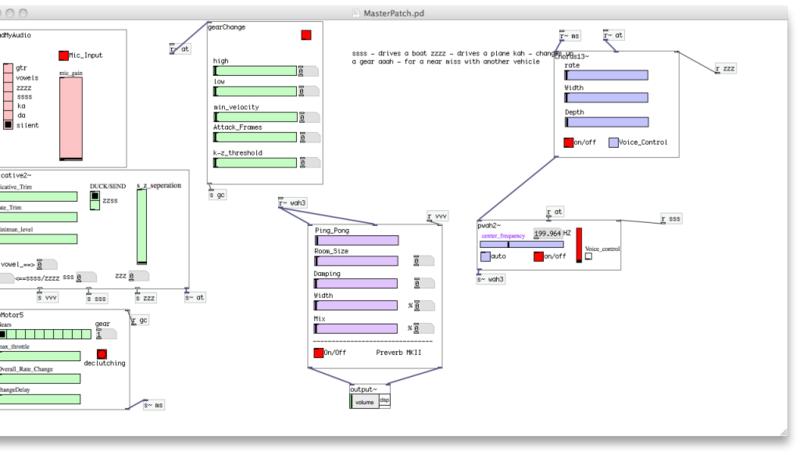 The Pure Data patch that I wrote is able to distinguish between various vocal sounds. These four sounds were used to drive an external physical model of a D.C. motor. Saying ‘ssss’ or ‘zzzz’ is effectively putting your foot on the gas, say ‘ka’ or ‘pa’ changes up a gear. ‘Aaaah’ turns on reverb and a ping ping delay to simulate other traffic, and, for the icing on the cake, ‘sssss’ switches on a randomly sweeping notch filter, the center frequency of which jumps further, with increased time intervals, the louder the input voice. This has the effect of making the motor sound like a speeding boat. ‘Zzzzz’ switches off the notch filter, and engages a three tap dynamic chorus effect, again controlled by amplitude. This makes the motor sound like a plane. Despite making people look quite silly, it proves to be quite an addictive waste of time. Having worked on this project as part of a small, but superb team, for a little over four years I feel deeply invested in it’s future. In this experiment I set out to determine if musicians can sell themselves more convincingly, just by moving a bit more. It turns out it’s true. it may be obvious on an intuitive level, but obtaining proof is another matter! Comments Off on Move your hips!